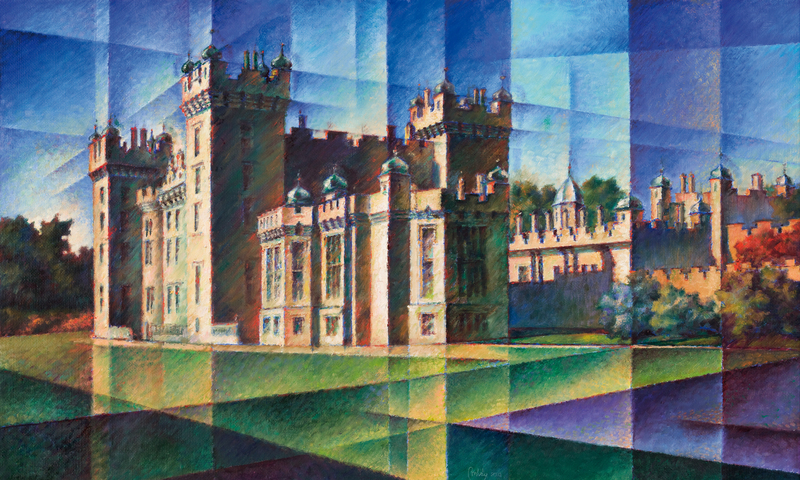 “Floors Castle – Scotland” by László Borbély is not only an image of a real building. The artist is not representing reality, he is interested in mixing of different visions, and showing them at the same time. In the way of representation is experiential, the picture is ruled by the painter’s own perspective. The primarity of personal impressions is showing up by the elements, which move the painting to idyll from reality, as the warm colors of the castle, and the bland lights. Although the real uniqueness of László Borbély’s painting is the technique he builds the picture with. “Floors Castle – Scotland” is like as we were looking through a prism to the view. The building and it’s environment becomes an unified spectacle through fusion of seperate geometrical forms. These forms are located under the structure of the building on the painting, they are actually the extension of the architectural space. That is, how “Floors Castle – Scotland” reinterprets reality, with different methods, on different levels.